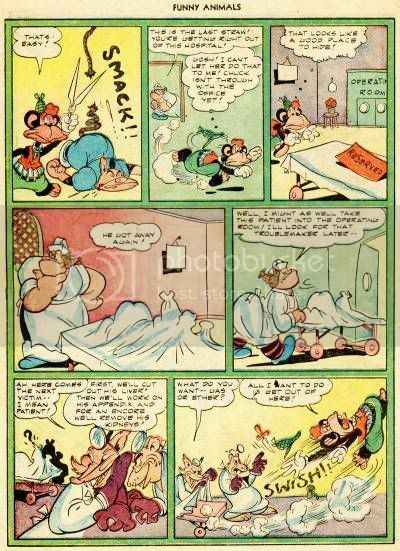 This inspiring article ("How To Pick An Animation School") at the ASIFA-Hollywood Animation Archive shows us how all those classic animators and cartoonists got to be so good. Along the way this post confirms what we've always suspected... the road to greatness in cartooning or any other craft is paved with lots of study, hard work, curiosity and perseverance. We can't afford to ever stop learning! 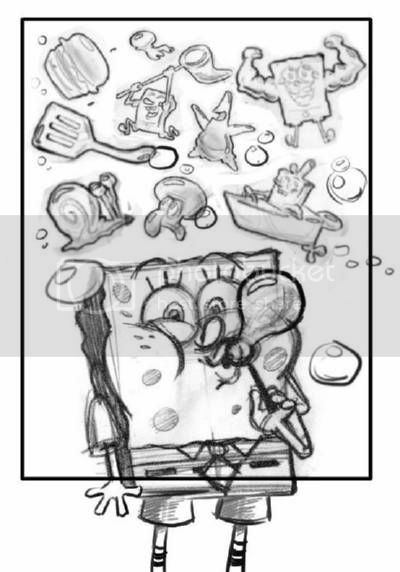 It's been a while since I did storyboards on the SpongeBob TV series, but I still get to keep my hand in it a bit when I do comics and illustrations for Nickelodeon Magazine. A couple months ago I got a call from them about drawing another cover, and I'm glad I jumped at it 'cause it was a lot of fun (Ok, it was a lot of work, too...but more on that later). 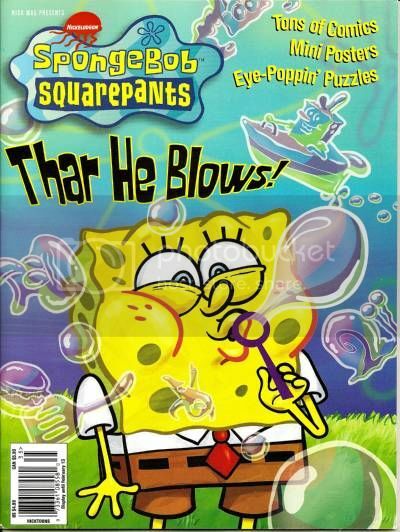 Well, it turns out there's not enough room on the cover to have that bubble so far from his face, so I had to try to have SpongeBob facing frontward, with the bubble overlapping his face, but without obscuring his smiling features! This took quite a bit of pencil wrangling, but by the time I drew the two sketches below, I thought it was working OK. The sketch on the left is the one went with, but I kept drawing. Even after I think I've nailed it, I try to do more drawings to see if something unexpected happens. In this case, the next drawing I did wasn't as good, so I decided to take the good one and scan it in so I could play around with the composition. 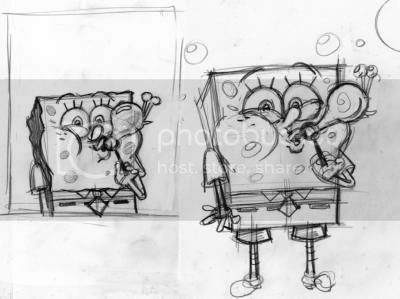 After submitting the above pencil drawing to Nickelodeon Magazine, the editors just asked me to change SpongeBob's eye direction. Originally they wanted him looking right at the "camera," but now they wanted me to have him looking at the bubble. 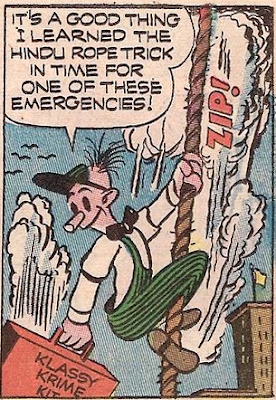 Okey-dokey...no problem. Here's the inked version (below). I do all this sort of inking in Adobe Illustrator, using the freehand brush tool. Finally, I "painted" the background using some pieces from stock backgrounds from the series that were painted long ago. I added the flower clouds by hand, and then blurred them in Photoshop. 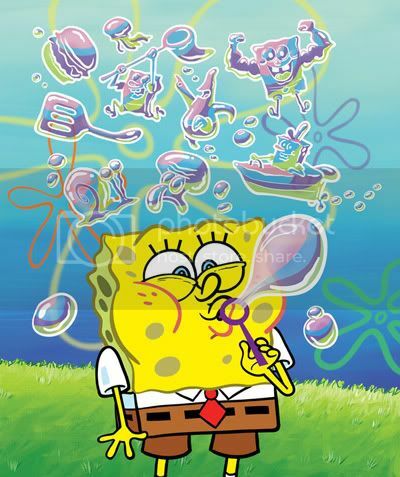 The hard part was getting the bubbles to look right; Each one has four layers with various transparencies. 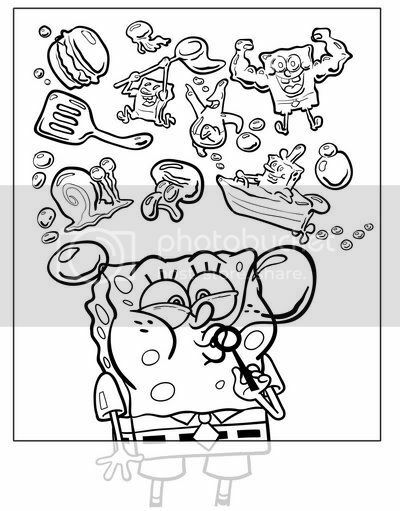 The flat colors on SpongeBob were done with the eyedropper and paint bucket tools. 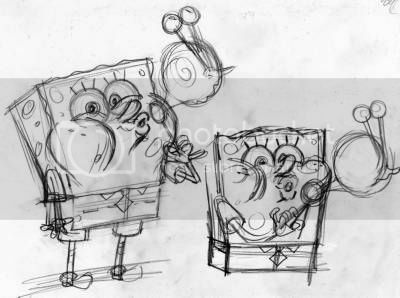 I sample the colors off of SpongeBob stock model sheets to make sure they're 100% accurate. Thanks to Tim Jones, Laura Galen, Chris Duffy and the Nick Mag staff for giving me this "cover shot!" Click on the painting to see the whole process! UPDATE! The first Tutorial Videos are posted! Keep checking this list of tutorial videos for more! Fangoria magazine has just published an online article that features some cool storyboard art by Pete Von Sholly from the new Stephen King and Frank Darabont horror flick, The Mist. 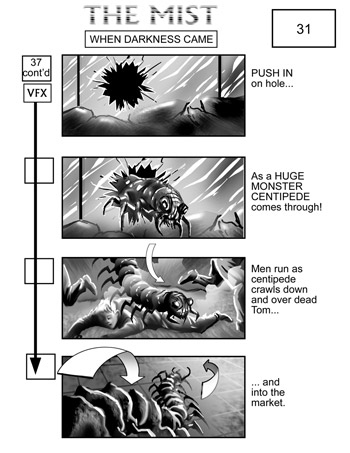 Wanna know HOW to storyboard? 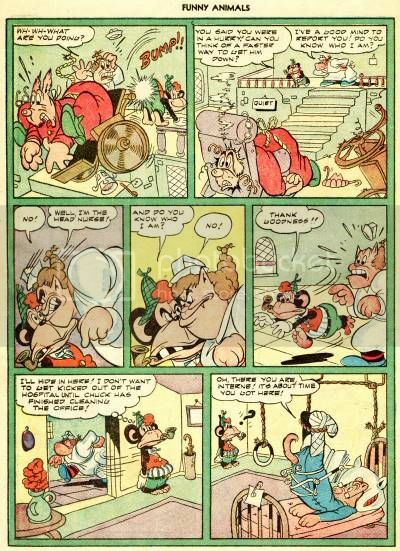 Hanna Barbera Treasury Book -- This Time They Got it RIGHT! 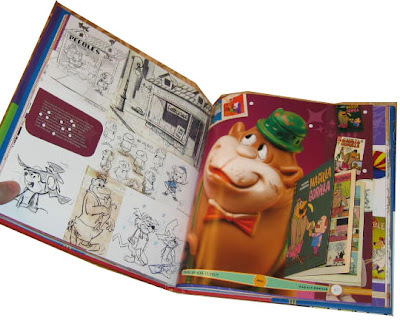 I just came across this new art book about Hanna Barbera's golden years called, "Hanna Barbera Treasury." There is so much wonderfulness to this giant-sized love-letter that I had to share it with all of you. 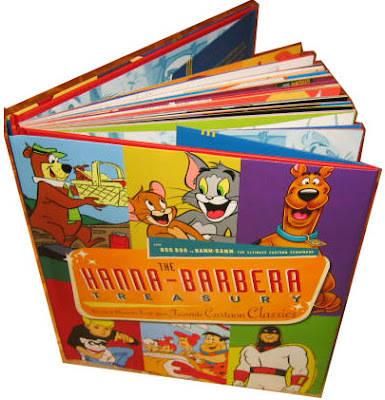 The Hanna Barbera Treasury is written by Jerry Beck, with photography by Tim Mantoani published by Insight Editions. 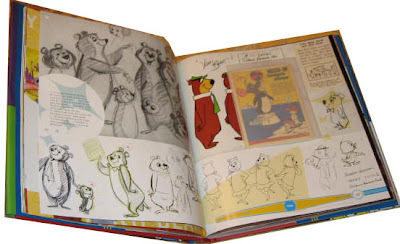 It measures a big 11 1/2" tall by 11 inches wide, and it's about 3/4 inch thick with 157 memorabilia-stuffed pages. If you're impatient like me, it costs $45 in bookstores, but Amazon has it for $29.70 (as of Nov 29th). Now, 157 pages may not sound that substantial, but what you can't tell from that number is that every oversized page is PACKED with photos of REAL production artwork (not those awful fakey-fake publicity "cels.") -- most of which was apparently photographed from original archival artwork! 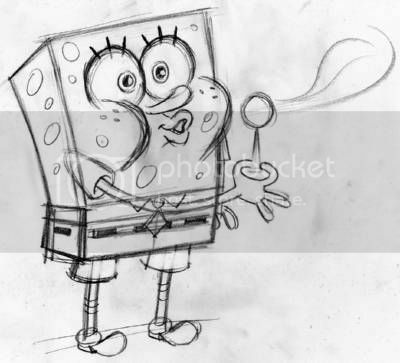 There are pictures of storyboards, layouts, animation drawings, model sheets, development sketches, character designs, etc...stuff that has never seen the light of day until now. I've been waiting for someone to put together this kind of book for ages. There are also tons of beautiful photos of vintage H-B collectible and toys, like plastic dolls and View-Master reels. If you remember the groundbreaking art direction in Chip Kidd's Batman Animated art book from the nineties, you can imagine what this looks like. The other feature that really expands the page-count is that there are tons of little envelopes and pockets and pamphlets bound into this book that contain beautiful facsimiles of trading cards, full-color 12-page mini-comic book reprints, Model sheets, storyboard sequences and vintage activity-book pages. ...and THEY STOP RIGHT THERE! Oh, happy day! 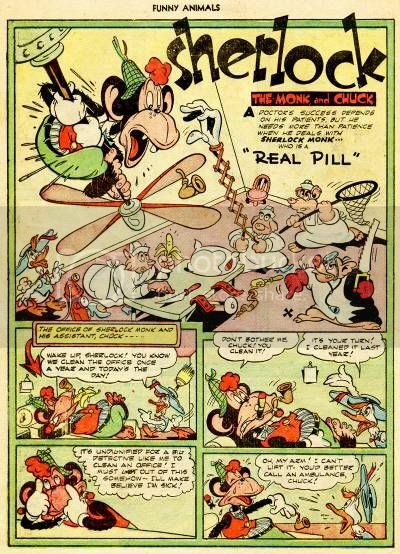 There's no need to pretend that the entire history of Hanna Barbera is totally golden...most of their output after the late sixties was totally forgettable. But they wisely chose to focus on the best of the best! If you felt horribly cheated by that awful Hanna Barbera Cartoons coffee-table book from 1999, this new book should make you forget all about that publishing nightmare. This new book a winner through and through! Caveat: I haven't READ the text yet, so I'm looking at this purely from a visual standpoint. I'm guessing that based on the love and devotion that obviously went into the art direction of this book, they probably didn't skimp on the textual accuracy either. The text is written by animation historian and Cartoon Brew-meister Jerry Beck, so I'm looking forward to reading it and posting another review later to complete the picture. 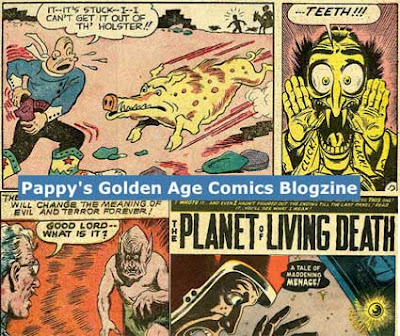 You gotta see: Pappy's Golden Age Comics Blogzine - The TREASURE is HERE! 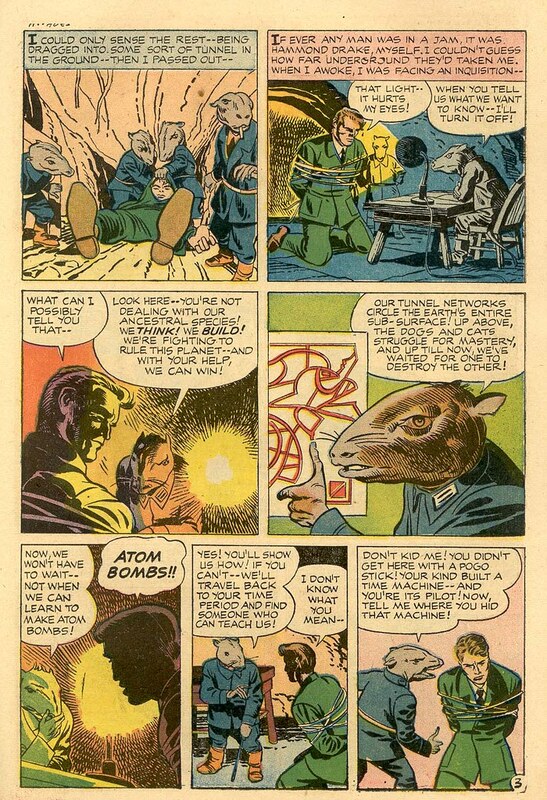 We're talkin' humor, horror, crime, science-fiction, funny animal comics...all the stuff nobody does in comics anymore. This is getting a big bookmark at the top of my list because it's a gold mine of comic book treasures that will keep me reading til my retina burns out. There are literally HUNDREDS of amazing entries, going back a couple of years! I've just started to dig into the archives, and I've already got the cold sweats. I don't know why I never saw this blog before, but TRUST ME I am going to be checking it out every day from now on! 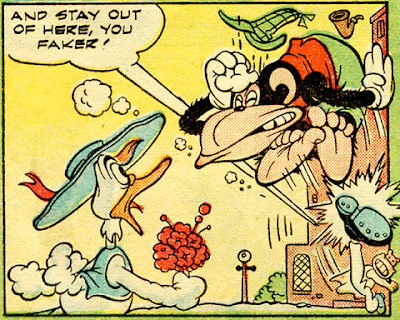 I gotta GO...Pappy's comics scans are calling my name! See you there! 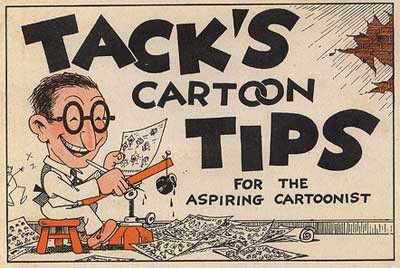 Look at what Dave Blog posted on his Flickr page: Tack's Cartoon Tips for the Aspiring Professional! 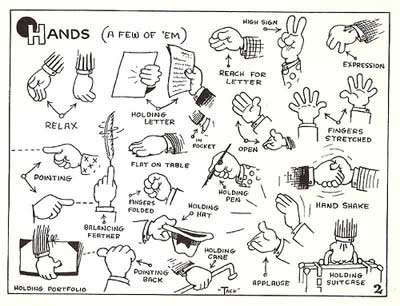 This is an amazing little how-to cartooning book from way back in 1923 by cartoonist B. "Tack" Knight. In just 29 pages he teaches aspiring professional artists how to draw cartoons the old-fashioned way! 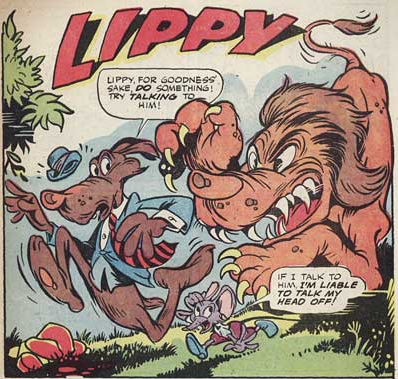 Some of the pages are corny and not very useful today, but MOST of this book features rock-solid basic building-blocks for learning how to draw in that old "bigfoot" early 2oth century print cartoon style. Warning: there's some old-school racially insensitive material in here. What people thought was funny back then just makes people mad today. Don't say I didn't warn you! 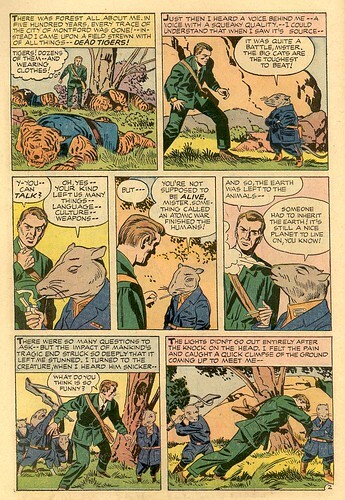 from Fawcett's Funny Animals #55 from 1947. 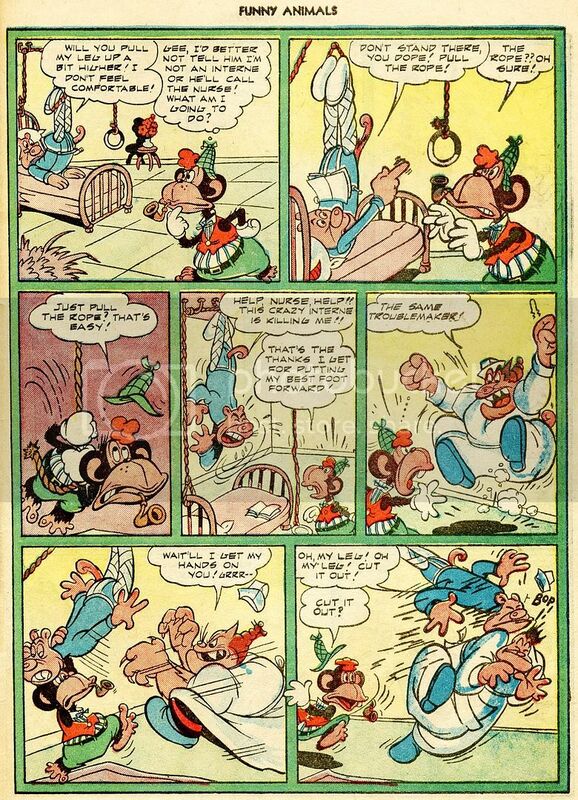 Look at that great kick in the penultimate panel! 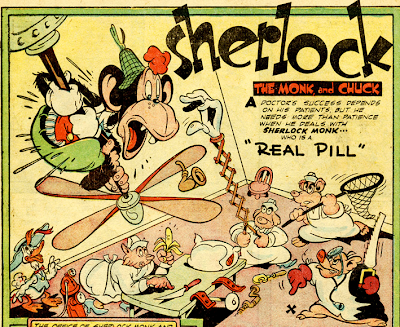 According to an interview in the Fawcett Companion, Sherlock the Monk and Chuck was one of many Fawcett Funny Animal features created by Chad Grothkopf. 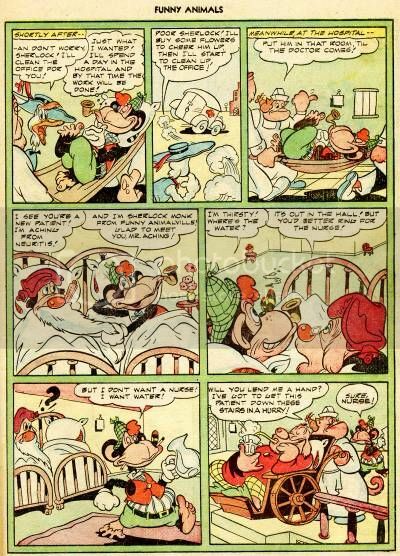 I don't know whether this particular story was done by him or not. Looks like Milton Stein to me, but I hope that better eyes than mine will set me straight. to the ARCHIVE and see the comics pages! Yep, I think Charlie J nailed it. 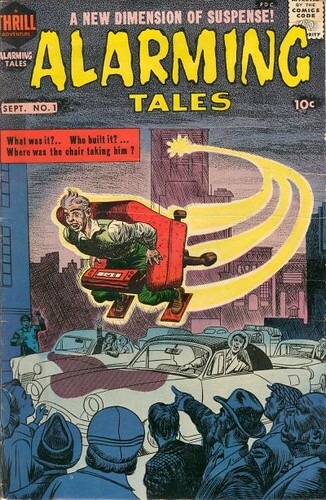 There are quite a few fantastic stories in this comic book; If you want to see more, please leave a comment below and let me know -- In the meantime, enjoy! (Click one or more of the links directly below) Thanks! 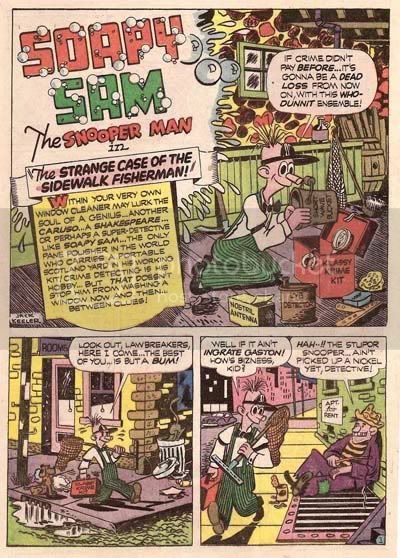 Soapy Sam: Howzabout More VARIETY in Comics? 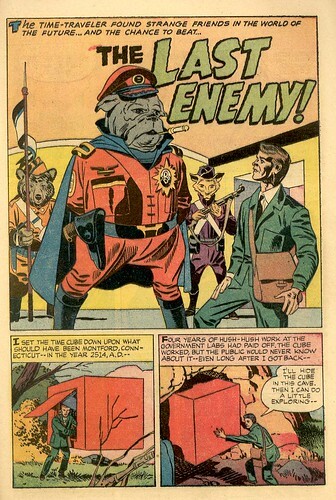 Comic books have changed an awful lot since the forties. There used to be a lot more variety; not just a lot of different genres and different styles...there were lots of successful anthology titles that had five or six ongoing series running concurrently in the same book for years. among the individual stories in each book. 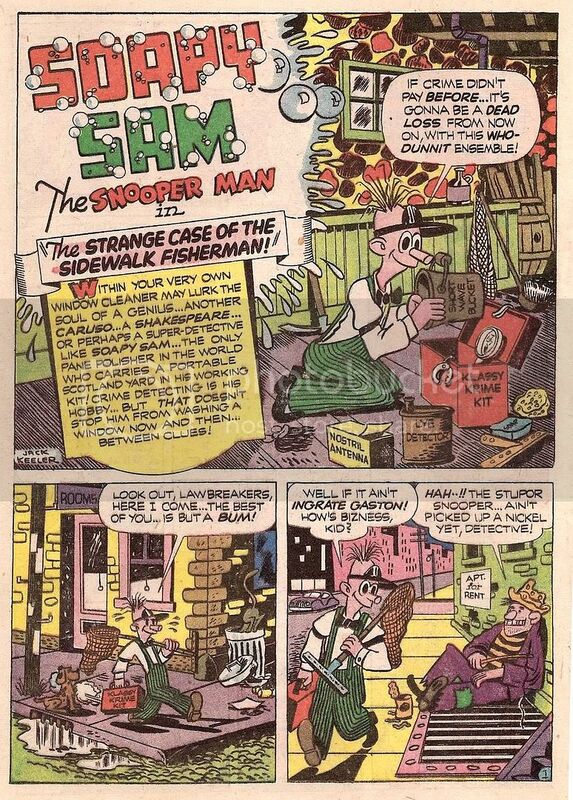 Today's "Exhibit A" is Soapy Sam the Snooper Man. but he dreams of being a detective. 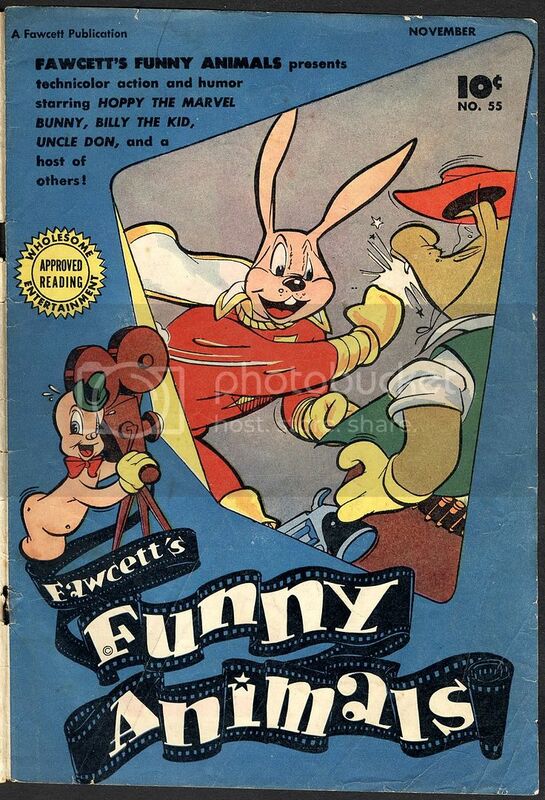 published by Home Comics, Inc. St. Louis, Mo. 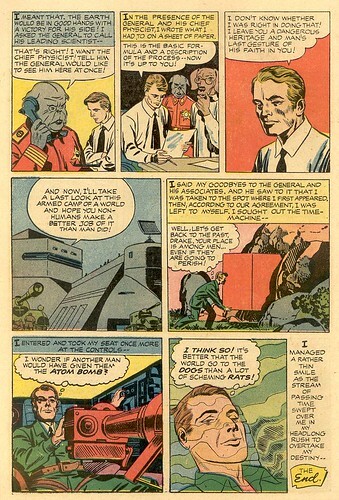 to see a king-size comic book page. 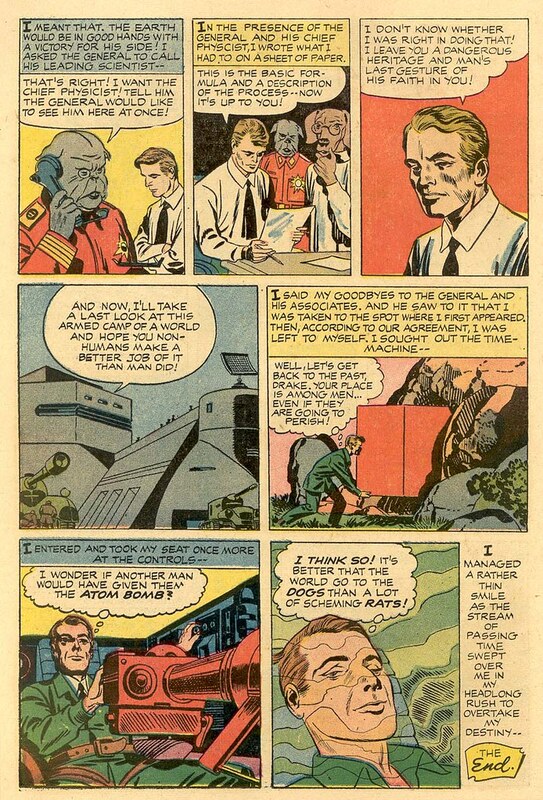 to see a grande-size comic book page. This story is signed "Jack Keeler." Jack Keeler!? Do you realize who that is? Don't look at me...I have no idea! And it's not for lack of trying to find out. Whenever I post one of these golden-age oldies, I try to find some background info to give it context. Can't find a blessed thing about Jack Keeler. 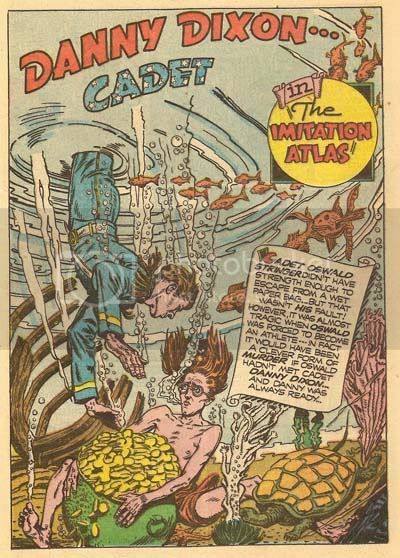 I bet there were hundreds of guys that drifted in and out of the totally disreputable comic-book trade, worked under pseudonyms for a few years on a few obscure titles, then went back to earn a decent, respectable living as insurance salesmen or electrical engineers. One of my favorite things about old comics is that they weren't afraid to mix up genres just to keep things fresh. In many crime and action-oriented comic books, they had these little one- two- or three-page fillers that sort of cleansed the palette in between the more serious stuff. 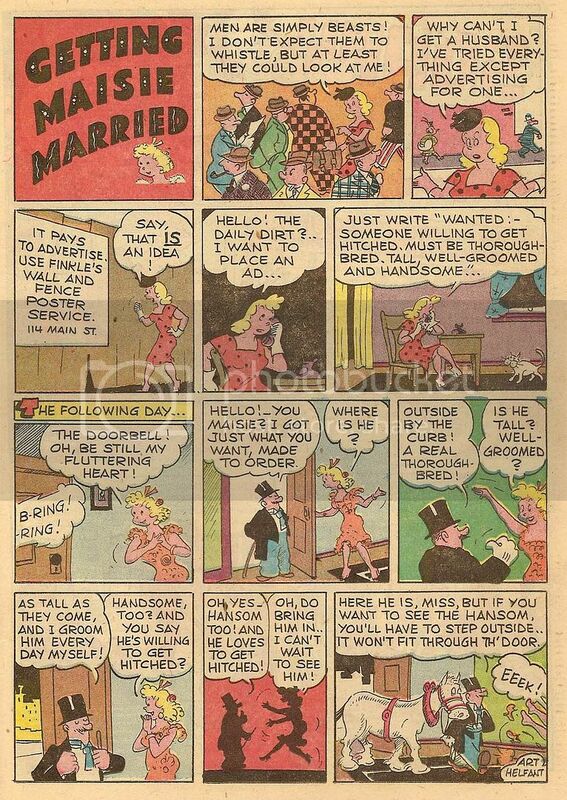 about a Miss Lonely-hearts called, "Getting Maisie Married." 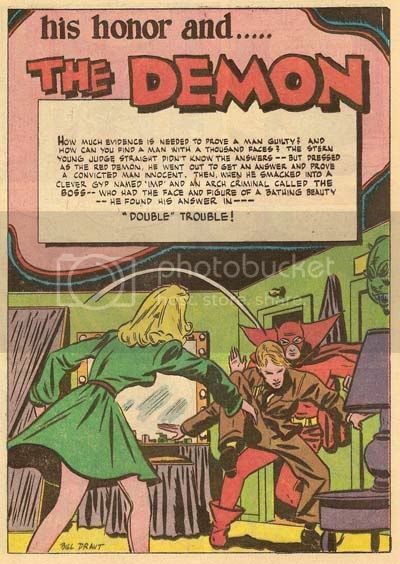 After the Soapy Sam story comes a real oddball title: "His Honor and...The DEMON!" 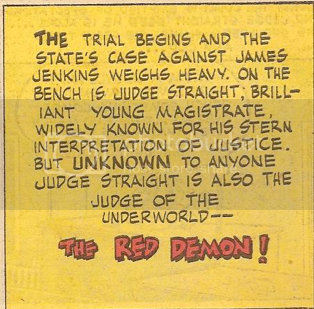 Signed by long-time utility-player Bill Draut, this Batman-style story is about a judge who dresses up as a red devil at night and metes out vigilante justice on the underworld criminals that are beyond the reach of his courtroom! 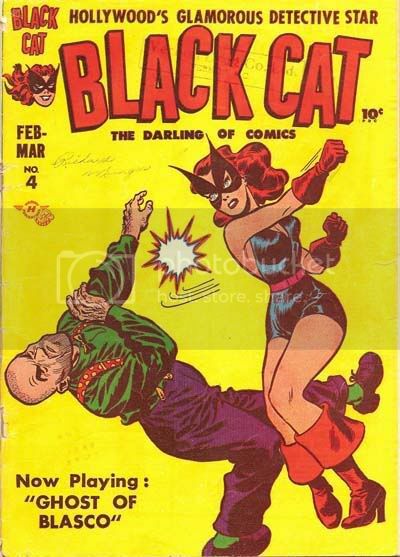 This issue of Black Cat finishes off with more short comedic comics. Two half-pagers stacked one on toppa the other. 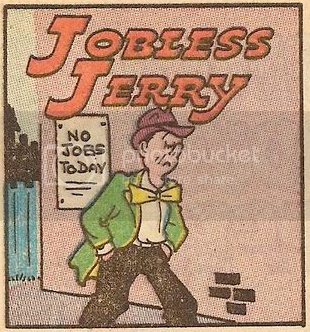 There's nothing more hilarious than being unemployed! 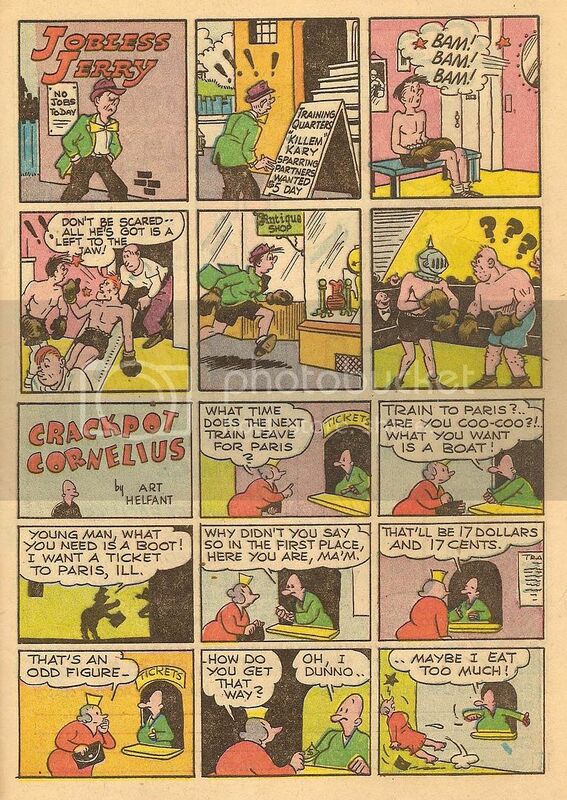 Not sure who did the Jobless Jerry strip, but Crackpot Cornelius was penned by gag cartoonist Art Helfant, who apparently drew tons of these comic book fillers during the 1940's and 1950's. I dunno...maybe Helfant did them both. Click the image below for the macho-sized gag page. Now THAT'S a comic book! Thrill, chills, jokes, even a classic "plop" panel at the very end of that last page. 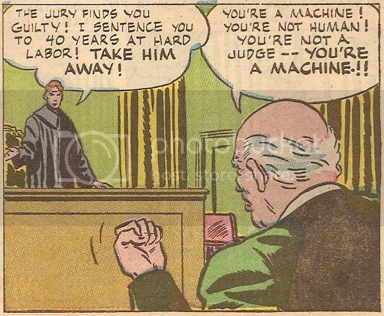 Call me old-fashioned, but I like comics that are FUN! 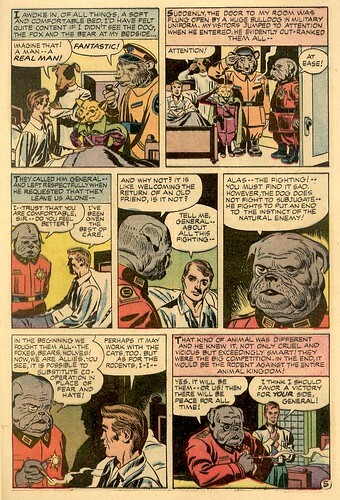 If you're interested in seeing any of those other stories from this comic, just let me know and I'll post 'em right up! See You next time! Bob Camp Shows You How to Draw Cartoons Better...or How to Draw Better Cartoons. Bob Camp is a really swell guy. When I got my first job in a cartoon studio, I didn't know jack about how to draw for animation. 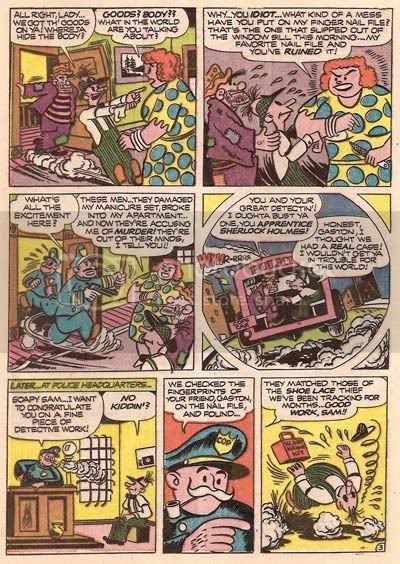 I was a comic book guy. Never really interested in animation up to that point because I had so many misconceptions about it. I (stupidly) thought that if you worked in animation, you had to draw the same picture a thousand times in row, moving each pose just slightly until you died from eyestrain and carpal tunnel. Lucky for me, Bill Wray of The Ren and Stimpy Show liked my comics enough to talk with me about doing storyboards. 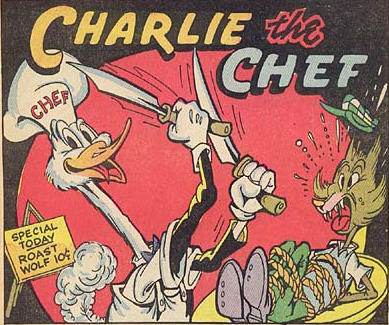 He straightened me out a lot about the art and artistry of great animation (Thanks, Bill!). I didn't get that storyboard gig, but I did get the chance to work on the last season of Ren and Stimpy as a trainee in the character layout department. That's when I got the chance to work with the wonderful Bob Camp. 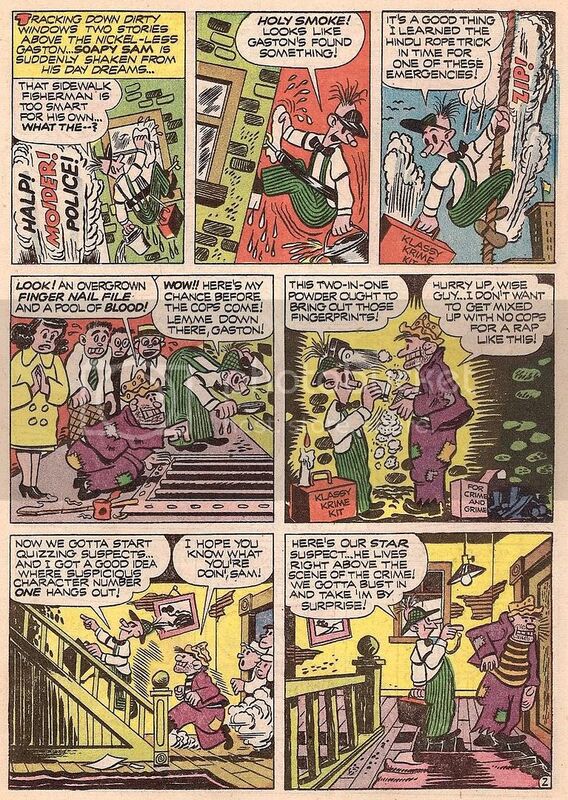 groovy cartooning lessons from Bob Camp! 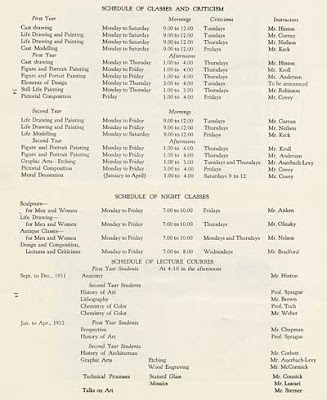 One of the coolest things Bob did in the studio was to have some informal drawing theory classes in the early morning before the start of the workday. I took a lot of notes, and I still refer to them today. Basic stuff...solid building blocks of character design and staging. The stuff most of us need to be reminded of all the time. 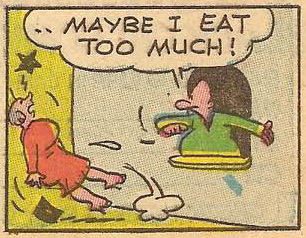 Anyway, I haven't seen Bob Camp in ages, but he's started his own blog over at http://bobcampcartoonist.blogspot.com. 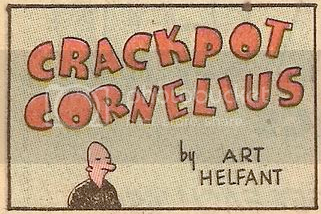 And he just posted a whole bunch of fantastic scans of some of his drawing theory lessons. 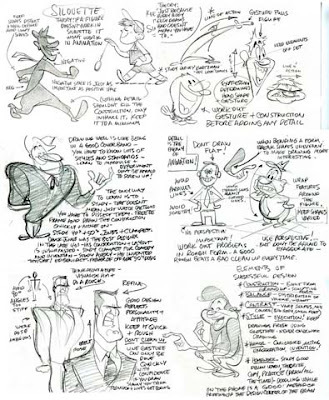 If you like cartoony cartoons, and you'd like to learn how to draw better, Bob Camp's drawing lessons are a great place to start! Thanks, Bob! 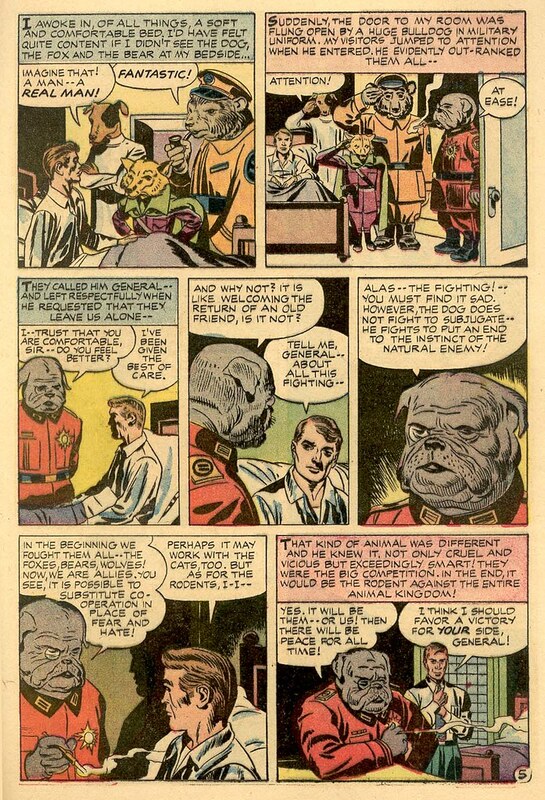 science-fiction comics from the fifties! 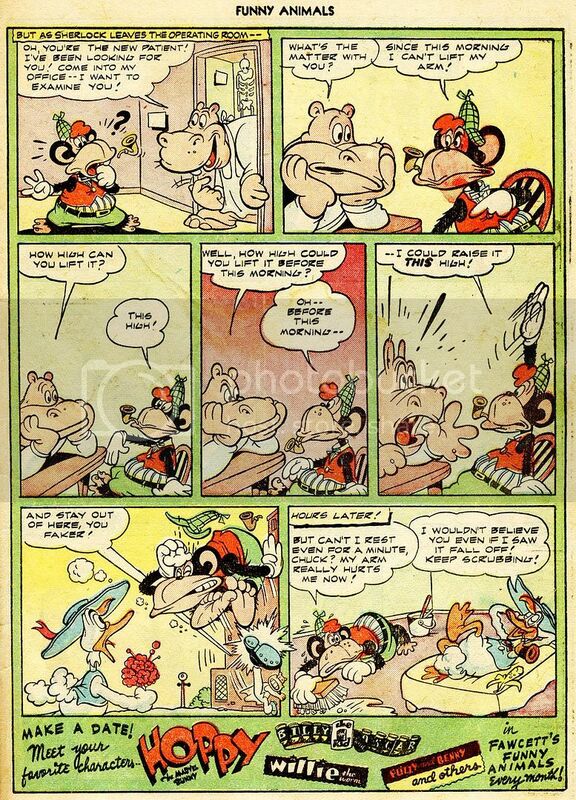 Published by Western Tales, Inc. and Harvey Features Syndicate. This story is one of five tales in this all-Kirby comic book bonanza. 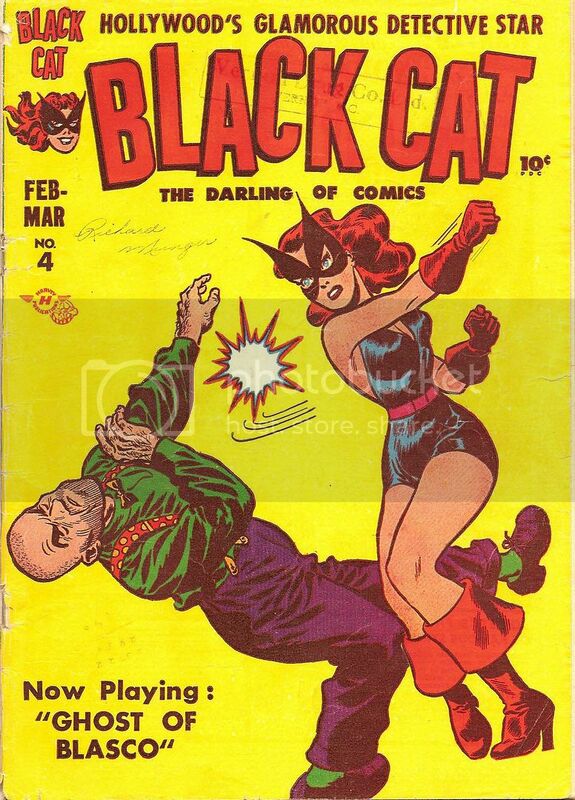 If you get a chance to lay yer mitts on this comic book, get it! It's a winner through and through! 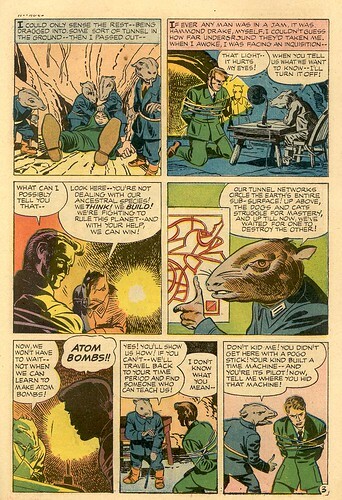 to see a large-size kooky Kirby komics page. ...and take a look at this very cool Jack Kirby Blog called the Kirby Museum. 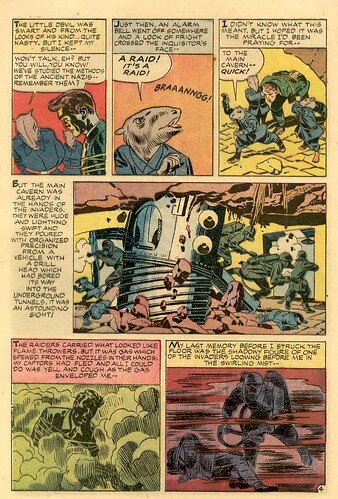 Lots of Kirby artwork to swim in!